For me, playing the harp is a ministry. Even when I’m performing a concert, I think of what I’m doing as ministry more than as entertainment. I always begin with a prayer that the Holy Spirit will play Her own music through me. I simply offer myself and my harp to be God’s instrument of healing, blessing, comfort, joy–whatever ministry God wishes to provide each person who hears the music or the audience as a whole. 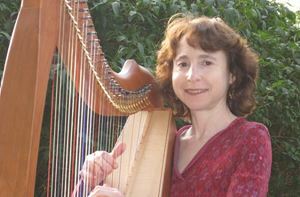 Because of the harp’s healing role in my own life, I felt led to learn more about the therapeutic effects of the harp. In pursuit of this knowledge, as well as the desire to play the harp for the healing of the sick, I entered the Music for Healing and Transition Program from which I graduated in February 2001 as a Certified Music Practitioner. A Certified Music Practitioner (CMP) provides live music as a service at the bedside of the sick or dying to facilitate their healing or transition. This service may be provided either in hospitals, in-patient hospices, nursing homes and other health care facilities, or in the home. Nothing is expected of the patient except to receive healing sounds, or in the case of the dying, to let go and make a peaceful transition. The music is administered unobtrusively, with unconditional love, and offered to meet the physical, emotional, and spiritual needs of patients. The CMP understands herself or himself as part of the medical team and that music is not a cure, but an aid to and agent of healing–one of several therapeutic modalities administered to patients. Confidentiality is strictly honored, and the CMP understands procedures concerning infection control, sterilization, safety, patient consent, and other institutional policies. Please contact me via e-mail if you’d like more information about the therapeutic effects and uses of the harp. If you live in the Indianapolis area, please contact me if you wish to have me serve you or a loved one with therapeutic harp music at your home or hospital/hospice room.